Barack Obama caved to the Taliban savages again today. The US will hold talks with the Taliban despite the fact they will not renounce Al-Qaeda. Wasn’t that the purpose of the invasion in the first place? 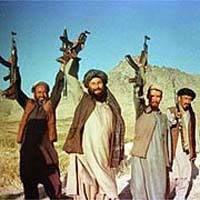 America will engage in its first formal direct talks with the Taliban on Thursday, after dropping its long-standing demand that the movement renounce ties with al-Qaeda in order for them to progress. The US will engage in its first formal direct talks with the Taliban on Thursday, according to officials, in a milestone on the road to peace after more than a decade of war. The first meeting will take place in Doha, the Qatari capital, after the Taliban opened their first official overseas office and Washington dropped its long-standing demand that the movement renounce ties with al-Qaeda as a precondition for the talks. “The US will have its first formal meeting with the Taliban, and indeed first meeting with the Taliban for several years, in a couple of days in Doha,” a senior official with Obama administration said. Afghan peace negotiators will also travel to Qatar for talks, according to President Hamid Karzai, speaking as Nato officially transferred authority to Afghan national forces on the ground in Afghanistan. The Obama Administration reportedly paid for the Taliban office in Doha, Qatar.